Prepare cakes according to instructions. Level each cake with a knife and spread one cake with the butter cream icing. Sandwich one cake on top of the other to form the base. Ice the entire cake with the remaining icing. Cream butter for 1-2 minutes. Add the milk, vanilla , cocoa and half of the icing sugar. Beat for approximately 3 minutes. Add the remaining icing sugar and beat for another 3 minutes. The icing is ready to use straight away. Using a vegetable peeler, peel the block of dark chocolate to make little chocolate curls. Sprinkle these over the top of the cake to make the dirt for the flowers to sit in. Wash and dry strawberries. Insert a skewer into the base of each strawberry. Melt 100g dark chocolate. Dip each strawberry into the melted chocolate and sprinkle with coloured sprinkles. 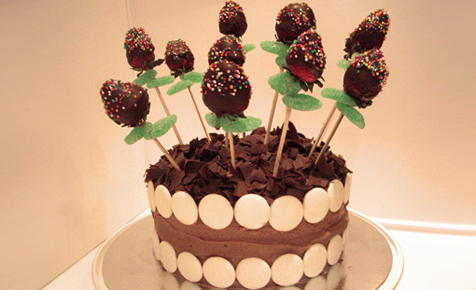 Position strawberries on cake by poking one end of the skewer into the cake. These are the flowers. The chocolate hardens quickly on the strawberries so make sure you have your sprinkles ready when you come to decorating the strawberries. If you choose not to use the chocolate cake I suggest, mak sure you use a dense cake, as you need the weight of the cake to support the weight of the strawberries.